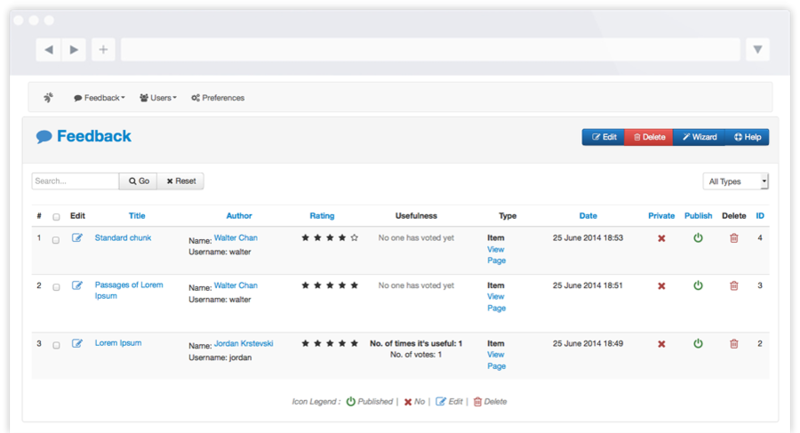 jFeedback is a user-friendly and easy to use website and product review tool designed to help you increase traffic and conversions to your online store. Improve online shopping experience and connect with customers with jFeedback. Earn comments on each of your Joomla article and learn from them. Make new friends and communicate with your customers, and build loyalty. Don't worry about bad reviews. You also have the option to moderate comments and ratings before they are posted. Get your visitors acquainted with other commenters from around the globe. Let them pick up ideas from each other. Or let them rate each other's posts. Get your customers checking on each other and certainly, you'll increase popularity. You can 'bolt on' jFeedback to your Joobi e-commerce which will help you promote your products more effectively and increase your revenue stream. There's no better marketing tool than letting your customers speak for you. Customer feedback do wonders to build trust and credibility, and increase online store conversions. Learn what your audience wants. Learn from their feedback and take them by heart. Take improvements on your products and specialize them based on what your audience needs and wants. Manage discussion communities to raise customer desire and acceptance.